​Friendships are important, but your guidance and monitoring of activities are needed for your child to be safe and successful. As children grow, friendships take on new meaning. Parents who have open communication and active involvement in the early years set the tone for ongoing deeper conversations about friends during the school-aged and adolescent years. Starting from the preschool years, you can be present and available when your children are playing with others. You can provide instruction about sharing and resolving conflicts without hitting or demeaning friends. These early play times allow you to see how your child interacts with other children and highlights your child’s internal social strengths and challenges. If your child is very shy, you will be able to help warm up initial interactions and, conversely, if your child is very social, you will be able to help him learn how to make room for a quieter friend. Even from the very start, children get very angry with friends. This gives you the opportunity to teach how to feel the emotional and physical sensation of anger and express anger without verbally or physically hurting others. It is also key to remember that anger is temporary. Your child needs to learn not to ruin a relationship out of momentary anger or frustration; the moment will pass. Adults often think “children need to work it out themselves.” Sometimes they do. But rarely do people learn the fine art of friendship without some support or role-modeling about healthy friendships. Children with different social skills will require different coaching about friendships. The shy child will need to learn to not respond to peer conflict with fear, worry, and increased isolation. The child with attention deficit hyperactivity disorder will need to be coached to slow down or filter their thoughts so that they can give their friend “a break” before being too direct or harsh. A very physically active child will have to be sure to avoid hurting friends when filled with frustration and anger. Children who have grown up in a home where a lot of anger is expressed or children who have experienced or witnessed physical violence at home will need specific skills to slow down their physical and verbal response to a threat. Welcome your child’s friends to your home. Be sure that they can follow the rules of your home. If speaking with respect and asking permission to have a snack is a core value in your family, be sure that your child’s friends can accept and accommodate these rules. If a friend is difficult for you to manage, this will give you good information about what your child is coping with and whether you need to be involved in supporting or redirecting this friendship choice. If there is any chance that you can join your child’s school, sport, or club event, get involved. Some preteens may ask that your involvement not “embarrass them,” but still be present. In these settings, preteens may ignore you and almost forget you are there. You will get the chance to see your child in action and appreciate how they get along with their peers. Be sure that you, as a parent, are involved in creating social plans. There is no reason to encourage texting or phone use before a child needs it to keep in contact with you. Once she is able to remotely communicate with peers, be sure you know who she is communicating with, how much time she is in communication, and the nature of what she is communicating about. Devices should be put away when the family is hanging out (parents included). Though friends are important, emphasize early that so too is family time. Some children will identify a best friend. This can be very helpful, as the duo can take on new challenges and bounce ideas off one another. Knowing your child’s best friend’s family can be helpful. You can help your child decide when the friendship is supporting her to take on new developmental challenges and when one or the other child might feel burdened by being a best friend to the exclusion of others. Early best friends allow you to start the dialogue about the lifelong challenge of balancing time with close friends, groups of friends, and family. Remember that peer relationships are the most important relationships, beyond the family, to teach children empathy. You can help your child identify how she feels when a friendship creates a disappointment. You can help her identify her own emotions, such as feeling rejected, angry, hurt, or sad, and then pay attention to the larger social interaction. This can allow her to empathize with her friend rather than just feel her own emotion. Guide her to learn that she should act only after her own emotions have been identified and she has considered her friend’s emotions or motives. Friendships offer the opportunity to learn about talking and listening. Children and adults need to learn that when you talk to a friend, that friend needs to be able just to listen. This is an ideal point to role-model. 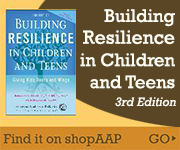 Parents can use friendships to drive home essential points about resilience. When a child chooses to talk to a friend about a concern, issue, or anything that made them upset, it is a sign they are a good friend. Figuring out how to communicate well with other people can be a significant source of strength. Teach that working things through with a friend is smart—you can avoid a fight (which usually only leads to more fighting anyway), save face because you took on (for boys, “manned up” to) the problem and, most importantly preserved meaningful friendships. Teaching children to preserve friendships with all their ups and downs is a tremendous skill that will bring lifelong stability in all personal relationships, including romantic ones. When a good friend moves away, this is a significant loss. But it also gives your child a chance to maintain a friendship over a distance. These friendships can provide a respite from school or sport friendships that have to deal with day-to-day hassles. Many risks that teens take on are proxy markers of maturity—signals that teens send to others that they are ready to be seen as a young adult. This is when you worry about negative peer influences. It is true that most of the major health risks in life are started during adolescence and in the presence of peers—cigarette smoking, alcohol use, exposure to sexually transmitted infections, and possibly even obesity. It is understandable and important for you to have concerns about the potentially negative aspects of peer influence. However, it is also important for you to remember that peer influence can also be protective and peer support can be invaluable. Children at different ages require more support. First it is important to know when your child is most vulnerable. Younger adolescents are most apt to conform to perceived group opinions and more likely to question their own opinion than even younger children or older peers. Your child may pass through this stage at age 11 to 13 or 13 to 15, and some late bloomers will be more vulnerable later. Knowing how your child is maturing in relation to their peers is important. In middle school, friends and friendships can seem to change. A friend who always loved to play with dolls will decide that such play is immature and want to be on her iPad texting others. A group of guys who could play street soccer all day now opts to stay inside and just play video games. Know your child’s “crowd” and understand how fitting into that crowd might create a “role” for them. For example, if your child is a popular student they may be a bit more adept socially than their peers, look or act a bit older, and can be influential. This can all be quite positive. But, they sometimes are aware that they have to try to act older than their peers to keep their popularity up. This can be a risk for them. As teens reach high school, friends get involved in different activities and friendship groups can become more diverse, but close friends might be better matched than in the earlier years. Some friends who have a new boyfriend or girlfriend will seem to just disappear. Teens develop social skills by hanging out with their peers. How to meet new people, converse in a group, make small talk, be teased and gently tease back, and generally share funny stories or jokes is one of the most important parts of friendship. Later in life, good friends will meet after a long break and often say it feels as comfortable to talk as when they first met in their teen or young adult years. In part, that is because they quickly get to the core of who the other person is, have a shared past, and often laugh at the same type of humor. Learning how to share your sense of humor with friends is critically important for social development because it can offset conflicts, mitigate criticism, and make life in general more fun. Encourage your teen to talk about all kinds of things with their peers. In conversations with peers, teens can have a back-and-forth discussion that feels more mutual than with adults who may have “already made up their mind” and inadvertently do not allow the teen to explore a range of ideas. Peers can be protective of your teen. Having a caring adult who is adept and “friended” without limits on your teen’s social network page is important. It ensures that you “know” to some degree the feel, humor, and different types of people that your child connects with. Rather than blaming a teen who is vulnerable to peer pressure for “not being able to stand up” to others, it can be helpful to know that you will need to rely on “face-saving” strategies to help your child stay safe. This will better allow your child to be different from peers. Parents deciding that a preteen cannot go on a sleepover to a home with poor adult supervision makes the parent look like “a huge pain,” but the preteen is spared potentially difficult decisions at the sleepover that he was not ready to face. One of the best things you can do to support good behaviors is to connect with the parents of your teen’s friends. Remember that one of the fundamental questions for adolescents is, “Am I normal?” and sometimes they will make unwise decisions to prove they are normal. If they are given clearer or stricter boundaries than their friends, they may feel as if they are being treated unfairly and rebel as a result. On the other hand, when parents work together to create common expectations, your teens do not feel like they are being treated differently and will more comfortably comply with the rules.